The SCEC Southern San Andreas Fault Evaluation (SoSAFE) group aims to increase knowledge of slip rates, paleoearthquake ages, and slip distributions of past earthquakes, for the past two thousand years on the southern San Andreas fault system. From Parkfield to Bombay Beach, and including the San Jacinto fault, the objective is to obtain new data to clarify and refine relative hazard assessments for each potential source of a future 'Big One'. Lengthen existing paleoearthquake chronologies that will improve understanding of the last 2000 years of this fault system. This includes radiocarbon dating and analysis of stratigraphic evidence of paleoearthquakes. Determine slip rates at many time scales, so that possible system-level interaction can be documented. Obtain the best possible measurements of geomorphic slip distributions from past earthquakes by developing field, LiDAR, or SfM datasets and validate the different measures or test uncertainties determined by each method. Catalogue the quality and supporting evidence for unique offsets, develop techniques to estimate slip distributions from these datasets. Explore chronometric, geomorphic, or statistical approaches to linking geomorphic offsets to dated paleoearthquakes. Use novel methods for estimating slip rates from geodetic data. Investigate methodologies for integrating paleoseismic (including geomorphic measures of slip) and geologic data into rupture histories. For example, studies may improve or inform interactions between SoSAFE results and scenario rupture modeling or rupture forecasts, test rupture histories using geometrically realistic fault configurations in dynamic rupture models. Requests for geochronology support (e.g., to date 12 radiocarbon samples) are encouraged and shall be coordinated with Earthquake Geology; a portion of SoSAFE funds will be contributed towards joint support for dating. We also welcome proposals that seek to add other data (such as climate variations) to earthquake chronologies, which may be used to improve age control, understanding of the formation of offset features, or site-to-site correlation of events. Research by single or multi-investigator teams will be supported to meet priority scientific objectives related to the mission of the SoSAFE Interdisciplinary Focus Group. SoSAFE objectives also foster common longer-term research interests and facilitate future collaborations in the broader context of a decade-long series of interdisciplinary, integrated and complementary studies on the southern San Andreas Fault system such as those targeted by teams investigating Special Fault Study Areas. Figure 1. New models of slip transfer from the southernmost San Andreas Fault onto the Mission Creek (MCF), Banning (BF) and Garnet Hill (GHF) strands based on slip rate studies stemming from the San Gorgonio Pass SFSA, from Gold et al. (2015). Figure 3. Paleochannels excavated for slip rate study at the Quincy site by Onderdonk et al. 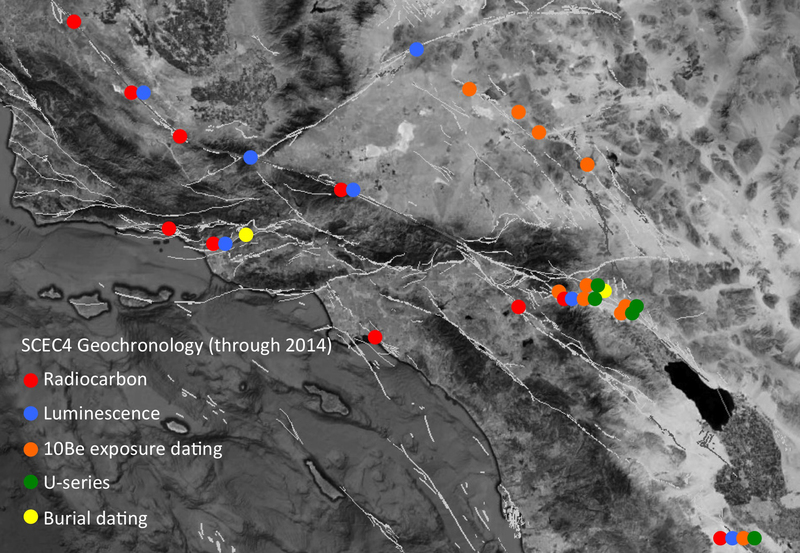 (2015) reveal variable strain release rates on the San Jacinto Fault over the last 2000 years. Figure 4. Summary of geochronological investigations and methods used in SCEC4 (Scharer et al., 2014). The SoSAFE special project focuses on geologic slip rate studies, paleoseismic investigations, and geodetic and modeling advances along the San Andreas and San Jacinto Fault systems. Recent accomplishments within this group include new data and analysis of the San Gorgonio Pass Special Fault Study Area, a workshop on geochronological methods used in the SoSAFE and Earthquake Geology community, and continued examination of the timing and size of earthquakes along the major plate boundary faults of southern California. Recent work by several independent geologic slip rate investigators have called into question slip models developed in UCERF2 which held that slip along the Coachella strand of the San Andreas fault was largely transferred westward onto the San Gorgonio Pass thrust and northward into the Eastern California Shear Zone, with no slip continuing northwest through other SAF strands in the San Gorgonio Mountains. At the eastern end of the Indio Hills, on-going work by Blisniuk et al. (2014) is consistent with a previous study by Behr et al. (2010) that indicates ~20 mm/yr is carried by the Mission Creek strand and that this rate has been constant since ~90ka. New studies were initiated along the northern strands of the San Andreas fault through the San Bernardino Mountains, where offset of Quaternary gravels on the Mission Creek and Garnet Peak strands indicate some slip continues to these latitudes, ultimately transferring slip onto the Mill Creek and San Bernardino strands of the San Andreas (Kendrick et al., 2015; Oskin et al. 2015). These results are compatible with strain observed in new geodetic results across the San Bernardino Mountains (McGill et al., 2015). To the south, Holocene rates along both ends of the Banning strand indicate slip remains low (2-6 mm/yr) along its entire length (Gold et al., 2015; Scharer et al., 2014). Within the Pass itself, studies by Yule and Heermance report Holocene dip slip rates on the San Gorgonio Pass thrust fault zone of 4-6 mm/yr, consistent with a paleoearthquake record that indicates ruptures are less frequent in the Pass than on the main San Andreas fault strands to the northwest and southeast (Yule et al., 2014). The emerging pattern suggests slip is accommodated along all of the mapped strands of the SAF. 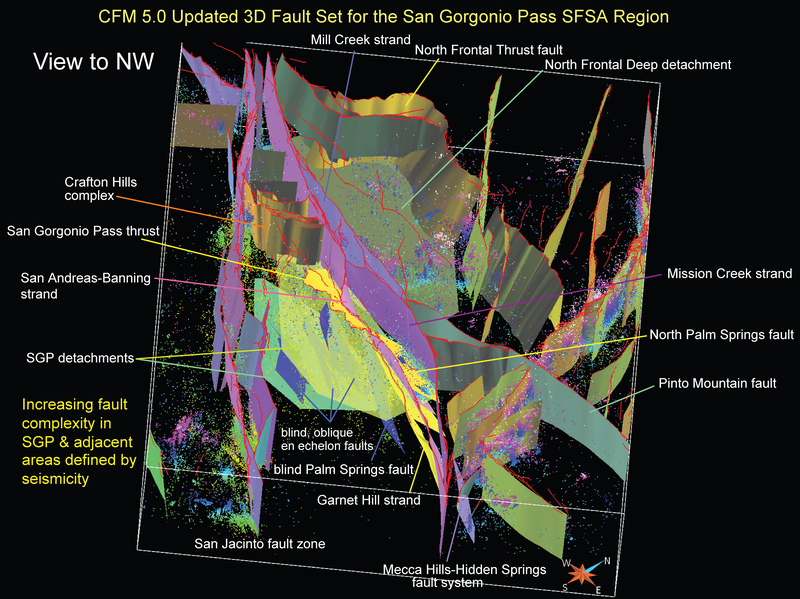 Examination of seismicity patterns and new geophysical data contributed to revised understanding of each of SAF strands within the latest CFM. Significant revisions include the Mission Creek, Banning, and Garnet Hill fault surfaces, which are steeply north dipping, and the San Gorgonio Pass thrust as a low angle oblique fault (Nicholson et al., 2014). Investigation of historical seismicity underneath the Pass reveals patterns of stress drop that are spatially clustered; large stress drops are concentrated in deep earthquakes below the high peaks of SGP (Goebel et al., 2015). Given the new slip rate, seismicity, and fault geometries, examination of the potential for thoroughgoing rupture on the San Gorgonio Pass thrust using dynamic rupture models is now focused on the influence of stress heterogeneities using different regional stress models (Shi and Day, 2014) and on the details of fault geometry (Oglesby et al. 2014). Paleoearthquake investigations at the Elizabeth Lake site were conducted to test the frequency of thoroughgoing rupture on the Mojave section of the San Andreas fault. The Elizabeth Lake record covers the last 800 years and includes 4-5 earthquakes; when compared to the rupture history proposed by Scharer et al. (2015) from the neighboring Frazier Mountain and Pallett Creek sites, it is consistent with one 300 km long rupture similar to the 1857 earthquake in the last 800 years (Bemis et al., 2015). On the San Jacinto fault, Onderdonk et al. (2015) published a new slip rate and slip-per-event data for two time periods on the Claremont strand. They show that while the average slip rate in the last 1500-2000 years was 12-18 mm/yr, rates were faster (21-30 mm/yr) for the last 500 years, the result of a short period of larger than average slip during more frequent than average earthquakes. Fault rupture models on the San Jacinto fault were examined with new data from the Mystic Lake site on the Claremont strand, where Onderdonk et al. (2014) show evidence of 11-12 ground-rupturing earthquakes in the last 2000 years at the Mystic Lake site. New dating of these events correlates less than half of the Mystic Lake events with earthquakes at the neighboring Hog Lake site (Rockwell et al., 2015), indicating some, but not all, San Jacinto ruptures may rupture the 4 km step onto to the Clark fault (Onderdonk et al., 2014). In the Salton Trough, Rockwell and Weldon are developing novel approaches develop a chronology of the lake levels of Lake Cahuilla using stable isotope ratios from gastropod shells and dating of in place stumps buried by lake sediment that will be used to more precisely correlate paleoearthquakes on the San Jacinto, San Andreas, and Imperial faults. An important new constraint from this work is the date of the last Lake highstand, now restricted to about 1720 to 1726 A.D. Paleoearthquake records from several sites in the Salton Trough indicate the most recent event occurred during a lake highstand, indicating the most recent event on the southernmost San Andreas fault occurred several decades later than previously estimated.